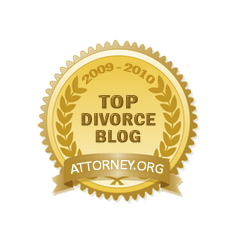 Illinois Divorce Lawyer Blog and Law Offices of Michael F. Roe is pleased to have been announced as a Top Divorce/Family Law Blog for 2009-2010 by Attorney.org. In addition to featuring breaking legal news, Attorney.org profiles different organizations and associations around the country to promote awareness and bring well deserved recognition to different causes. I enjoy writing for my Firm’s blog, presenting cutting edge issues and developments in Illinois Divorce, Custody, and Family Law. I will continue to do my best to illuminate important issues in Illinois Divorce law, and share with my clients and followers of the Blog insightful information that affects divorcing families. Issues concerning parental alienation, high conflict divorce, psychological issues in custody cases, collaborative and cooperative divorce, and trends toward shared parenting will be just a few of the subjects that I plan to focus on for 2010.